2011 was a tumultuous year as it saw citizens’ movements toppling dictatorships all around the Arab World. Former president Hosni Mubarak’s fall in Egypt was ably aided by social media that helped citizens rally together for a cause. 2011 also saw a huge anti-corruption movement in India that was headed by a 70-year-old crusader Anna Hazare. This movement saw a huge participation by the Indian middle class, the same section of society which also has a presence on the Internet. The movement that called itself ‘India Against Corruption’ (IAC) had a very active presence on social media including sites like Youtube, Facebook, Twitter etc. Co-incidentally it was in 2011 that the Government increased its curbs on the internet, despite already having problematic provisions with the existing IT (Amendment) Act, 2008. Let’s first get into the main problems with the amendment of the Act that happened in 2008. Till 2009, India’s Internet Freedom Status was relatively free and censorship was sporadic. Till then, the government did not particularly bother about censoring the Internet. The status changed after Mumbai, the financial capital of India suffered a massive terrorist attack in November 2008. This lead to the Government making sure that the state had the powers to decrypt communications done over the Internet, especially post-terrorist attacks. The terrorist attacks in Mumbai in 2009 changed the scenario and the Internet Freedom Status became set to ‘Partly Free’ and has remained unchanged since then. The amendment made in 2008 to the IT Act (which governs the Internet) brought in criticism by cyber activists and netizens alike since the amendment was passed without any discussion in the Parliament and had clauses which enabled violation of civil liberties. Under section 69 of the new amended act, it is possible for the police to snoop through one’s emails, phone calls, texts and other personal communication over the Internet without any warrant for the same from the magistrate. 69B. (1) The Central Government may, to enhance cyber security and for identification, analysis and prevention of intrusion or spread of computer contaminant in the country, by notification in the Official Gazette, authorise any agency of the Government to monitor and collect traffic data or information generated, transmitted, received or stored in any computer resource. (2) The intermediary or any person in-charge or the computer resource shall, when called upon by the agency which has been authorised under sub-section (1), provide technical assistance and extend all facilities to such agency to enable online access or to secure and provide online access to the computer resource generating, transmitting, receiving or storing such traffic data or information. (4) Any intermediary who intentionally or knowingly contravenes the provisions of sub-section (2) shall be punished with an imprisonment for a term which any extend to three years and shall also be liable to fine. After the above mentioned amendment, the central government fired a new salvo in April 2011 that made some alert Indian netizens sit up and take notice. The Indian Government formulated two sets of rules to the Information Technology (Amendment) Act 2008. The first rule set out to make the intermediaries including companies like Google, Facebook etc. and Internet Service Providers responsible for the content their users upload. The second set of rules make cybercafé owners to maintain a record of all their users who use their services to access the Internet. The repercussions of these rules were seen when Aseem Trivedi, a cartoonist from Kanpur could not access his website in the last week of December 2011. Aseem Trivedi, an ardent supporter of IAC had uploaded political cartoons on his website—www.cartoonsagainstcorruption.com. Subsequently he received a mail on December 27th from BigRock, the domain name and web host where his site was registered. The mail informed him that they were suspending his domain name and associated services since they received a complaint from Mumbai Crime Branch that he has been using the website for displaying objectionable content related to the flag and emblem of India. He has ever since migrated to a new website. (The cartoon above shows Indian Parliament as a commode among many others which were deemed as offensive). Anja Kovas, of Internet Democracy Project, points out to a graver effect of such regulations. "Censorship on the Internet is very different from the censorship in the real world. There will always be ways to circumvent it. However, it is mostly the tech-saavy geeks and people with the knowledge of technical know-how who will have access to such technologies. For majority of people, access to such knowledge will not be easy. The danger of such laws is that the society will be polarised between people who can enjoy freedom of expression and those who cannot." December 2011 saw India’s Union Communications and Information Technology minister Kapil Sibal calling for social media biggies including Google, Facebook, Twitter amongst others to pre-censor content uploaded by their users. This invited widespread criticism from Indian netizens and media alike. He later clarified that he did not mean pre-censorship of content but meant that companies ought to have standards that prevent such content from being on their space. He also insisted that these companies need to follow the law of the land, which meant that the social media companies ought to follow the restrictions to freedom of speech as deemed by the constitution. Content that violate the following issues are considered as restrictions and violations on freedom of speech. The media in India does not enjoy a separate ‘freedom of press’ as enshrined by the USA constitution but the freedom of press is subsumed under the freedom of speech and expression, a fundamental right. However, there are many curbs on the Indian media. For instance, Radio news is completely banned in India with the State owned ‘All India Radio’ enjoying a complete monopoly over broadcasting news over the radio. Internet till 2008 was relatively free and censorship by Government sporadic. 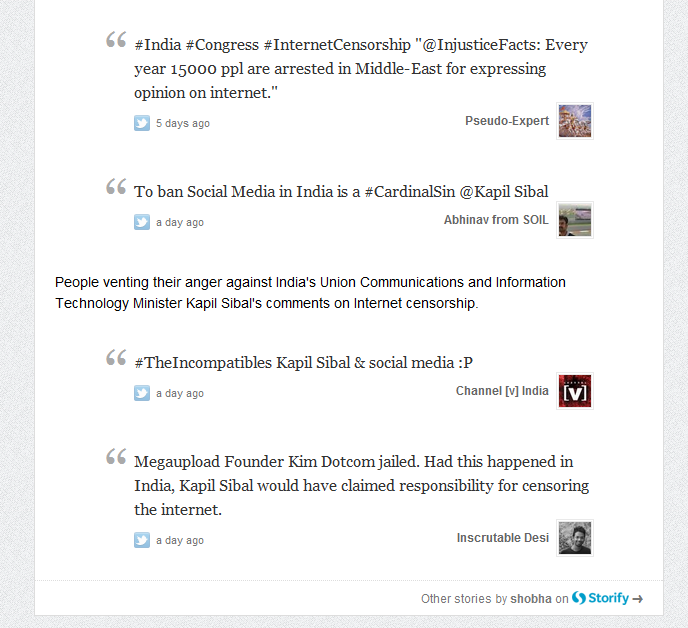 Sibal's proposition received a widespread criticism amongst the netizens, especially on Twitter. Amidst the din of censorship of the Internet, intermediaries like Facebook, Google and other companies faced a fresh jolt when Vinay Rai, editor of a Delhi-based Urdu newspaper Akbari, filed a case against them in December 2011 for allowing objectionable content up on their sites. Rai has submitted examples of what he deems as offensive content against various religions and religious figures that he found on the sites of these companies. However, Rai chose not to interact with the websites regarding this issue. He stated that the government is the ultimate authority to deal with multinationals in matters like these. Indian Penal Code has strict provisions against promotion of religious enmity in the country including Sec 153 (B), Section 298 among others. Even as Google and Facebook have argued that they are not legally responsible for the content uploaded by the users, things don’t look rosy, thanks to the cyber laws in India. The outcome of the case is still pending since the case is still with the Delhi High Court. When the debate over Internet censorship was at its peak, Google revealed data that showed the true intentions of the Government. According to Google, the company received 68 content removal requests (which included 358 items in all) from the Government of India in the first half of 2011 (January – June) of which 51% of the requests were adhered to. The reasons ranged from defamation, national security, government criticism amongst others. It is interesting to note that of all the requests, only one of them was attributed to National security, the main reasons cited for the amendment that happened in 2008. In April 2011, Centre for Internet and Society, a research and advocacy organisation in India revealed that the Government of India banned around 11 websites using provisions like 69B, which aforementioned give sweeping powers to the Government. While Google stood up to the Chinese Government refusing to adhere to the latter’s censorship norms, it has not exactly shown the same spirit in India. Recently, this month, the Delhi High Court responding to a civil suit filed by Aijaz Qasmi, an Indian citizen ordered Google to remove ‘offensive content’ from their sites. A statement released by Google read: “This step is in accordance with Google's longstanding policy of responding to court orders.” Google has already resorted to self censorship and have claimed that they will respect the law of the land. Twitter has also declared that it will censor tweets geographically. Trivedi says, “This was bound to happen. Companies like Google, Facebook and others are business entities. They will ultimately bow down to these unfair laws. It is ultimately up to citizens of India to fight these unfair laws.” Kovacs adds that, "By making intermediaries accountable for content uploaded by the users, the Government is making sure that a vast amount of internet users can be controlled and this is dangerous." If Facebook were a country with the number of users on it, it would be the third largest country in terms of the population. Internet by its very nature has broken geographical boundaries and epitomises the Sanskrit adage of Vasudaiva Kumtumbakam—the world is but one single family. To impose laws that are applicable to a particular geographical area to a space that knows no geography is going to be tricky indeed. While Google has announced that it will censor content as needed by the laws of the land, the same aforesaid content could be accessible in other countries. This is an exercise in futility since proxy servers could be used to access the same content from the same country where it is banned. The battle in India is in the backdrop of global threat to Internet freedom. More than 100 countries plan to meet in Geneva on February 27, to give United Nations, power to control the Internet. While it remains to be seen how Internet censorship takes root and is fought in India, the global fight just gets as interesting! I have been wondering about this issue for a long time. Thanks for posting. Now ,Politians are afraid of there insult on internet. whatever you want to say it is true and now days Mr. anna hazare is doing good so we should support him. we should fight with Corruption. I like your post thanks for posting. This was really a quality post. I'd like to write like your article - taking time and effort to make such an article. I just found your blog and want to say thank you ! What an enjoyable time looking through so many sites. It is really nice post thanks for sharing and just keep up the good work ! Nice work very professional weblog!! thanks for sharing!!! No individual act can justify a government clutch on internet freedom. As a subscriber of an Australian internet service provider, I believe internet should be free from any hindrance. I will be really glad my spouse and I witnessed an excellent web site. I have to thank a lot a lot of information! Hello admin! Your article is really appreciable. 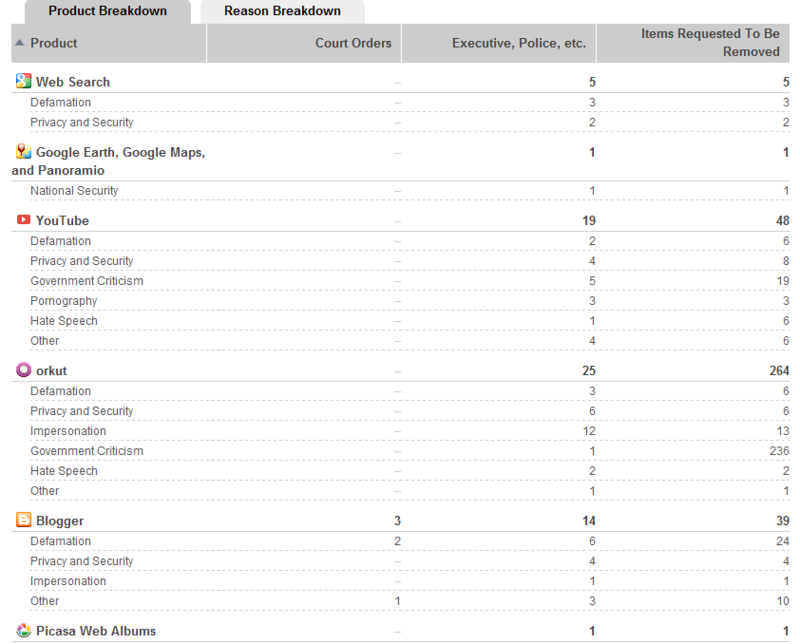 I have been seeing rubbishes mostly on blogger, but i have found your web from some blog, but i forgot the name.. Anyhow thanx for this..
A very informative and detailed article. Learnt a lot. Thanks for sharing! !